Michael and I cooked some impressive dinners for his parents and Kat’s parents, but we had to up the ante a bit for my family this winter. 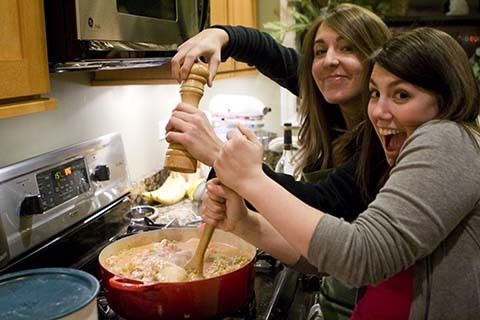 I’ve been cooking magazine meals with my parents for as long as I can remember. (I got my first subscription to Gourmet before I lost my first baby tooth. Not kidding.) So we decided to make a North African feast with lots of lamb, chicken and couscous. 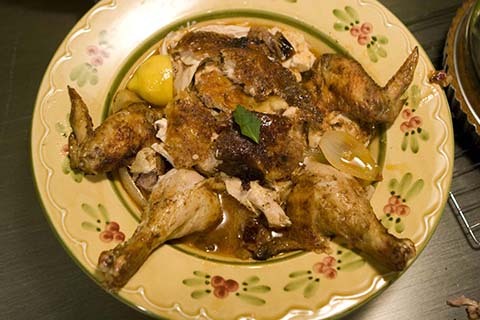 I’ll say two words about this chicken: spice butter. 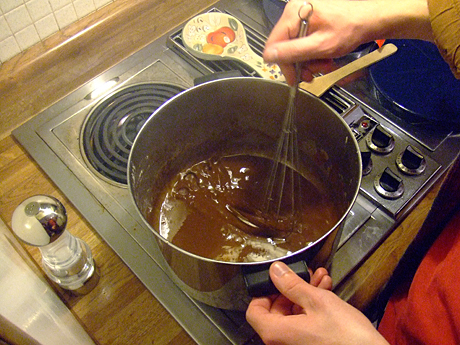 Ok, I want to give you more words: Butter, cumin, coriander, paprika, cayenne and cinnamon. Rubbed all over. Now, I’m not normally a glutton for chicken skin, but spice butter. I ate everything but the bones. The stew was also great, even though we totally rushed the process. The Darwell family has too high of metabolism for slow food. Luckily the stew didn’t suffer. The broth was full of flavor and just barely spicy, even with a whole habanero. Though, I have to give credit to the Los Angeles grocery store and the country of Australia for the lamb, which managed to be fork-tender even though we lumped off probably an hour of cooking time. 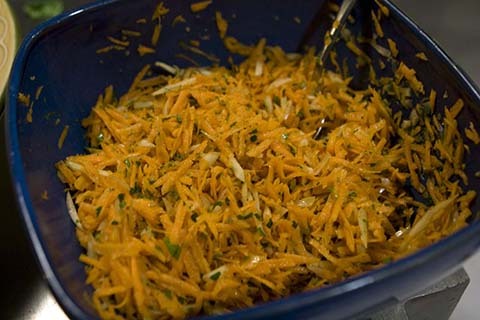 refreshing carrot and fennel slaw. 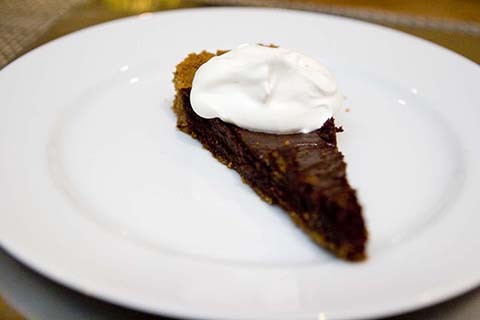 For dessert, I kept the spice theme going by making dark chocolate tart with gingerbread crust a la Smitten Kitchen. Play some Algerian music from Cheb Mami, Rachid Taha or Khaled. Samira Said from Morocco is good too. If you can recommend any Tunisian artists, let me know. This is the meal inspired by a sausage and a song. 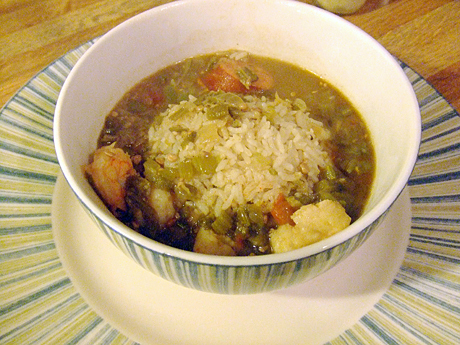 When the campus meat market started offering andouille sausage, I knew we had to make gumbo. Then our friend Kat discovered a song listed under the genre “gumbo funk,” and we had a soundtrack. 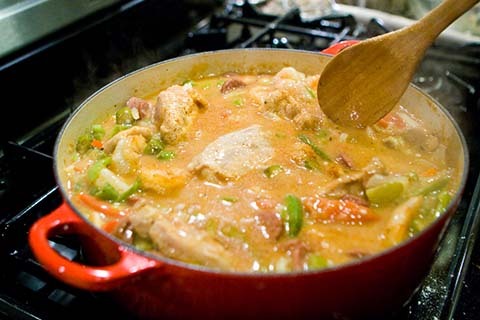 We cooked up a big ol’ pot of gumbo for Michael’s parents when we went to visit, and maybe Michael’s mom just loves us, but she couldn’t stop talking about how good it was. I can’t say I’ve had a ton of gumbo in my day, but this was the best one I’ve tasted. 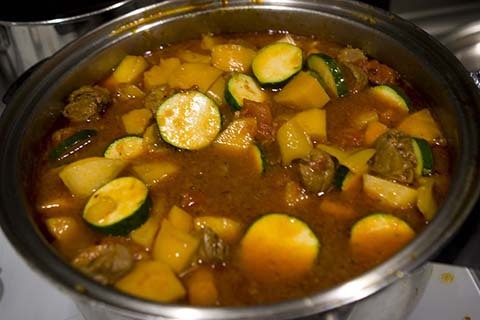 The vegetables maintained their form and taste, instead of becoming a pot of mush. The chicken, sausage and shrimp each brought their own flavors too. 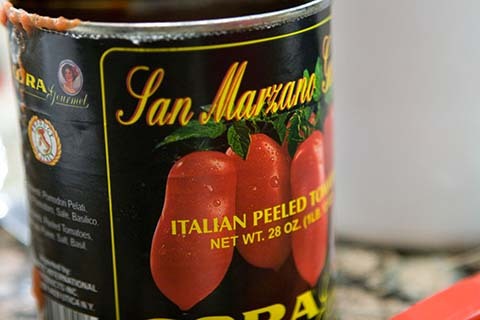 According to Michael, the best canned tomatoes available. Don't even try to argue otherwise. This Food Network recipe just called for chicken and andouille, but I felt like there should be some seafood. You can do scallops too. The only other change we made to the recipe was adding a combination of Cajun spices to the flour in which we dredged the chicken. In addition to salt and pepper, I added paprika, chili powder, celery salt and oregano. If you have a packaged blend, that works too. 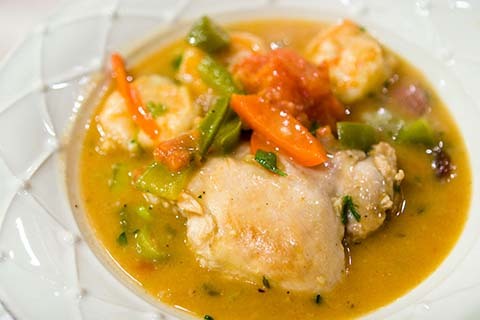 Change whatever you want in the recipe, but make sure you have some gumbo funk on the playlist.